As one of the most popular destinations for international tourists, Bali has attracted a sizeable and growing labor force in the tourism sector of the economy. This fact has triggered Balinese labor force to participate in such service industry. As a supplier of tourism labor force Bali has been increasingly successful in promoting the number of workers to be employed on cruise ships. The participation rate of Balinese women in cruise industry over the last four years has dramatically increased. The Balinese women’s participation in cruise ship employment has brought major implications for their life and culture. Generally, the present study aimed to provide an overview of Balinese women employed on board of a cruise ship. More specifically, it examined (1) the strengths, weaknesses, opportunities, and threats faced by Balinese women working in cruise industry, (2) factors influencing them to work in the industry, and (3) the implications brought by such employment for their life and society. The present study used quantitative and qualitative data collected through economic, social, and cultural approach. The sample was comprised of 200 respondents selected using accidental sampling method. To answer the research questions, data collection was conducted through observation, interviews, as well as focus group discussion (FGD). The data on the strengths, weaknesses, opportunities, and threats faced by Balinese women on board of a cruise ship were analyzed using SWOT analysis, whereas the data on the factors influencing them to work in the cruise industry were analyzed using factor analysis. Finally, qualitative analysis was employed to analyze the data on the economic, social, and cultural implications for their life. The analysis showed that: (1) Balinese women were employed on board of a cruise linerpredominantly as support staff. The strengths of Balinese women cruise ship workers included being friendly, always smiling, being honest, being loyal, being responsible, and being highly skilled. Their weaknesses included having low motivation to get a high position, having low English proficiency level, and having insufficient self-confidence. The job opportunities were still high since women were generally reluctant to work in the cruise industry. The threats they faced included the lack of concern on the part of the government, agents providing poor services and unjustly treating applicants. (2) The factors influencing Balinese women to work in the cruise industry were of economic, social, and cultural. (3) The implications brought by the cruise ship employment for Balinese women were divided into three: economic implication, social implication, and cultural implication. Economic implication refers to their ability to help increase their family income. (b) Social implication refers to the fact that through employment in the cruise industry they could elevate their and their family social status. Lastly, (3) cultural implication refers to their contribution to the preservation of their own culture (i.e. Balinese culture). DARMA OKA, I Made; ANTARA, Made; MUDANA, I Gede. Balinese Women in The Cruise Ships Tourism Industry. 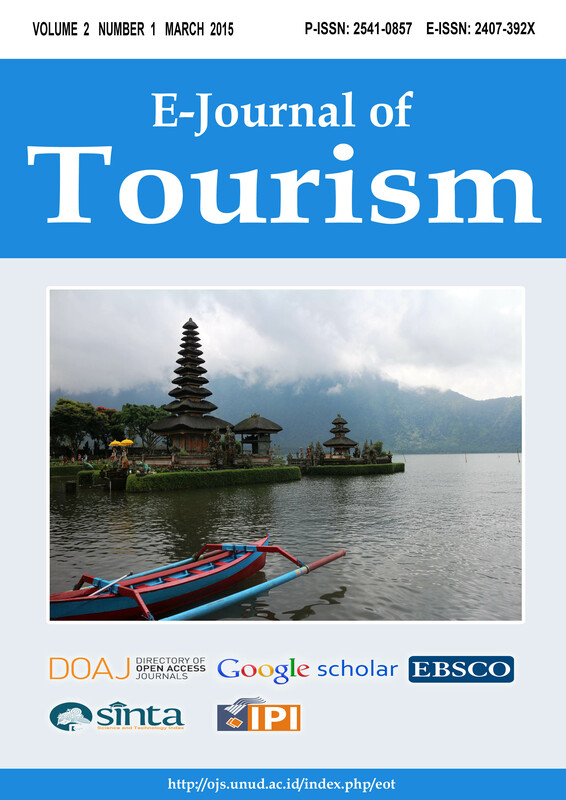 E-Journal of Tourism, [S.l. ], mar. 2015. ISSN 2407-392X. Available at: <https://ojs.unud.ac.id/index.php/eot/article/view/19440>. Date accessed: 22 apr. 2019. doi: https://doi.org/10.24922/eot.v2i1.19440. E-Journal of Tourism is licensed under a Creative Commons Attribution 4.0 International License.